Saint Fiacre was a seventh century hermit in County Kilkenny, Ireland. His holiness, skills with herbs, and healing powers led to great unwanted fame. He wanted so much to be left alone with God that he fled Ireland and went to France. He prayed, fasted, and tended his garden. Seeking to build a monastery, Fiacre asked Saint Faro for a plot of land. Faro told him he could have as much land as he could turn in one day. Using only the end of his staff, Fiacre miraculously toppled trees and cleared an uncanny amount of land. A nosy woman who witnessed the miracle mistook it for witchcraft and went running to tell Faro. Luckily Faro recognized it as a miracle, but because of this event, no women was ever allowed into Saint Fiacre's monastery. 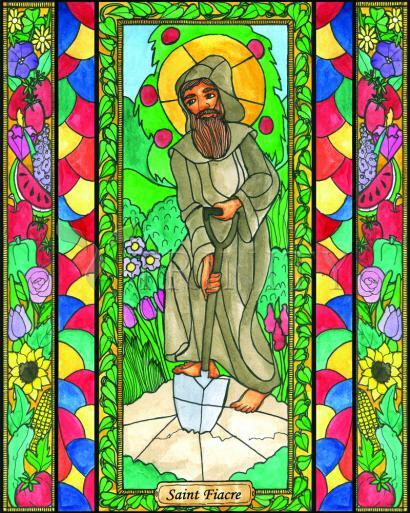 As the patron saint of gardeners, he continued his skill with plants, cultivating not only healing herbs, but vegetable and fruits as well to feed the poor. Today, people can often see a statue of Saint Fiacre in many gardens all over the world. Saint Fiacre was an Abbot born in Ireland about the end of the sixth century. He died August 18, 670. Having been ordained a priest, he retired to a hermitage on the banks of the Nore of which the townland Kilfiachra, or Kilfera, County Kilkenny still preserves his memory. Disciples flocked to him, but, desirous of greater solitude, he left his native land and arrived, in 628, at Meaux, where St. Faro then held episcopal sway. He was generously received by Faro, whose kindly feelings were engaged to the Irish monk for blessings which he and his father's house had received from the Irish missionary Columbanus. Faro granted him out of his own patrimony a site at Brogillum (Breuil) surrounded by forests. Here Fiacre built an oratory in honor of the Blessed Virgin Mary, a hospice in which he received strangers, and a cell in which he himself lived apart. He lived a life of great mortification, in prayer, fast, vigil, and the manual labor in the garden. Disciples gathered around him and soon formed a monastery. There is a legend that St. Faro allowed him as much land as he might surround in one day with a furrow; that Fiacre turned up the earth with the point of his crosier, and that an officious woman hastened to tell Faro that he was being beguiled; that Faro coming to the wood recognized that the wonderworker was a man of God and sought his blessing, and that Fiacre henceforth excluded women, on pain of severe bodily infirmity, from the precincts of his monastery. In reality, the exclusion of women was common in the Irish foundations. His fame for miracles was widespread. He cured all manner of diseases by laying on his hands; blindness, polypus, fevers are mentioned, and especially a tumor or fistula since called "le fic de S. Fiacre". His remains were interred in the church at Breuil, where his sanctity was soon attested by the numerous cures wrought at his tomb. Many churches and oratories have been dedicated to him throughout France. His shrine at Breuil is still a resort for pilgrims with bodily ailments. In 1234 his remains were placed in a shrine by Pierre, Bishop of Meaux, his arm being encased in a separate reliquary. In 1479 the relics of Sts. Fiacre and Kilian were placed in a silver shrine, which was removed in 1568 to the cathedral church at Meaux for safety from the destructive fanaticism of the Calvinists. In 1617 the Bishop of Meaux gave part of the saint's body to the Grand Duke of Tuscany, and in 1637 the shrine was again opened and part of the vertebrae given to Cardinal Richelieu. A mystery play of the fifteenth century celebrates St. Fiacre's life and miracles. St. John of Matha, Louis XIII, and Anne of Austria were among his most famous clients. He is the patron of gardeners. The French cab derives its name from him. The Hôtel de St-Fiacre, in the Rue St-Martin, Paris, in the middle of the seventeenth century first let these coaches on hire. The sign of the inn was an image of the saint, and the coaches in time came to be called by his name. His feast is kept on the 30th of August.